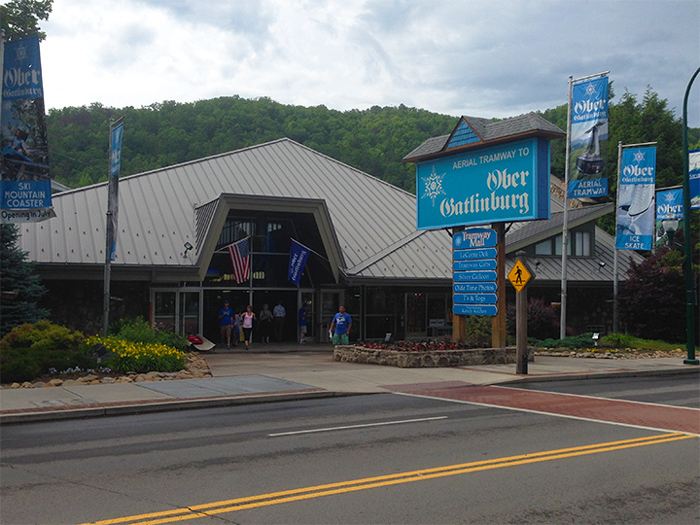 In 1962, Ober Gatlinburg began as one of the first ski resorts in the American South. At the time, It was a novel idea at the time that a Ski Mountain could make its own snow, but in retrospect man-made snow has really taken off. Thanks to the cold winters and mountainous terrain of the Smoky Mountains, skiing in Tennessee has been a fixture in Gatlinburg ever since. Located on property adjacent the national park, this ski slope offers beautiful scenery and slopes on Mt. Harrison only a short drive from Gatlinburg. In recent years, Ober Ski Mountain has expanded its list of attractions and activities to become a truly year round attraction that continues to delight visitors. The mainstay of Ober is, of course, its ski slopes. With 10 runs and 2 quad lifts, the mountain offers several runs for beginners, intermediate, and advanced skiers and snowboarders. The longest run from the top of the mountain, "Ober Chute" is just under a mile in length and descends over 500 vertical feet to the base. Here is a map of Ober's Ski Runs. 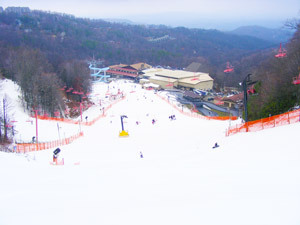 A new addition to Ober is a terrain park added in 2009. This features several rails, boxes and jumps for freestyle snow sports. If you do not own ski equipment, it's easy to rent from the lodge. A Ski Shop here caries all the gear and apparel you need for a day on the slopes. Also, lessons are available for visitors who are new to skiing. Thanks to a new grant from the National Ski Areas Association, Ober has taken initiative to make their slopes more sustainable and increase their snow making capacity at the same time – a definite win for skiers and the environment. Insider Tip: Parking on Mt. Harrison Requires a Fee. For a more interesting trip and free parking, consider purchasing a tram ride up the mountain instead. Insider Tip: If you are renting ski and snowboard equipment, arrive well in advance of your skiing session. The waits can be long and arriving early means you can enjoy a full day on the slopes and make the most of your money. 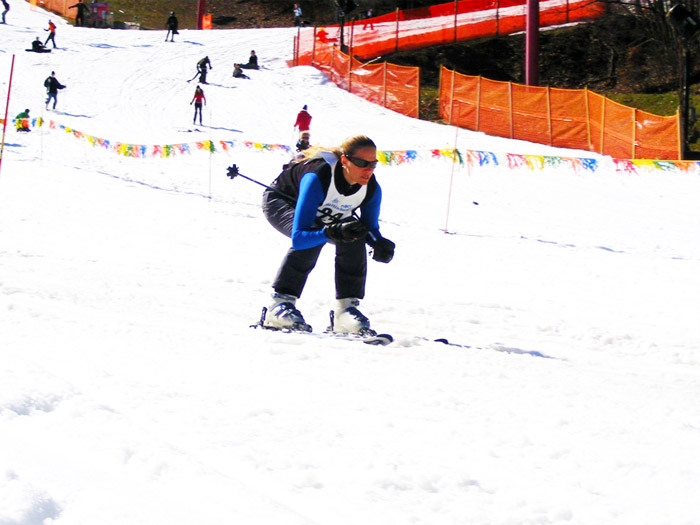 This popular snow activity offers visitors 300 feet of exhilarating downhill action. As always, snow tubing is a big hit with the kids. Children 6 years and older can ride unaccompanied, but younger children must ride with an adult. In the world of tubing, what comes down must come back up (at least if you want a ride.) Thankfully, a magic carpet conveyor transports tubers to the top of the slope and saves them a tough slog uphill. Tubing at Ober is very popular and sessions can fill up quickly. To ensure a quality experience, Ober limits the number of tickets so that the runs aren't too crowded. Tubing tickets are sold first come, first served basis and only be purchased on site. Call ahead in advance to check how crowded the runs are or if tubing sessions have been canceled or delayed due to weather. Insider Tip: Presale tickets can be purchased at the tramway mall in downtown Gatlinburg next-day sessions session. These tickets are good both for the ride to Ober on the tramway and a tubing session. Aerial Tramway – Ober enjoys a great location, but it did have one drawback. The drive up the mountain roads to the resort could be a little daunting to visitors. For this reason, Ober constructed the Gatlinburg Aerial Tramway in 1973. This tramway not only allows for skiers to enjoy ample parking in town, but it also grants riders panoramic views of the Smoky Mountains. Since it began operation, the Tramway has transported over 18 million passengers from Gatlinburg to Ober. The tramway ranks as one of the largest cable cars in the U.S.
Insider Tip: Views from the aerial tram are great anytime of year, but if you could only go one time of year, Fall brings in awesome colors to the Smokies. Likewise, a trip in the tram is breathtaking at night when you can observe the dazzling lights of the valley. Chair Lift – A scenic chairlift (beginning at Ober Ski Lodge) transports visitors higher into the mountains. A glance over your shoulder brings you increasingly stunning Smoky Mountain views. A great place to bring a date or an opportunity for some scenic mountain photos. Arcade – This large arcade features fun video games and games where you can earn tickets for prizes. A great activity for the kids! Alpine Slide – After a ride to the scenic chair lift, you can pair it with an adrenaline pumping descent down the alpine slide. You'll love flying down the contours of the mountain with these two weaving tracks that pass through woods and ski trails. Don't worry though, every sled is equipped with a breaking device so you can go as (fast) or slow, as you like! Indoor Ice Skating Arena – In the heart of Ober's Mall area, you'll find a huge ice rink that operates year round. Ice Skates are available for rent, and this activity is a great alternative if skiing or snowboarding just isn't your thing. Wildlife Encounter – A small zoo operates at Ober Mountain that features local animals like bears, energetic river otters, cute bobcat kittens, birds of prey, and more! Additionally, Ober offers a large playground and ride for young kids that also operates for the summer season. These rides are part of the expanding amusement park section of Ober, making is a truly year round venue for family fun in the Smokies. A new mountain coaster is slated to open Spring of 2015 and is creating a lot of buzz in the Smoky Mountains. This new ride, modeled after popular mountain coasters in Europe, will soon be the longest of it's kind in the Smoky Mountains and is bound to delight adrenaline junkies. With all the great activities at Ober, it's a good thing that there are great places to eat at Ober. The main mall area features pizza, snacks, fudge and other treats, but Ober also boasts a restaurant with terrific views. The "Seasons of Ober" restaurant offers quality dining close to the slopes and a beautiful view of the Great Smoky Mountains. If your lucky enough to be in Gatlinburg for it's seasonal festivals, it's definitely worth a stop. A local favorite is the fall Oktoberfest in Gatlinburg that is held every year on Ober Ski Mountain. This festival features authentic Bavarian food, song, dance, and of course, delicious German lagers. No matter what time of year you visit Ober Gatlinburg; there are always plenty of ways to have a great time. Even better, we offer many cabin rentals near Ober Gatlinburg so that you can take full advantage of all that Ober has to offer for your ski trip, family vacation, or couples getaway in the Smoky Mountains!